>CLICK- RESERVE NOW for MOTHERS DAY TABLES and PARTIES • We are open Easter and Mothers Day for Regular Menu and SPECIAL Menus! Here are a few submissions received from our customers. > Add your review today! We went out to celebrate my birthday..I heard about this restaurant and how good it was. I wanted to check it out for myself.I was so impressed by the delicious food and the wonderful service. This place was top notch. The restaurant itself was so cute. We will be going back, that's for sure. in one word "AMAZING". Had a surprise anniversary party here for close friends and food was excellent!! The service and attention to detail was wonderful. I really appreciate the entire staff including Gary the owner for making it an unforgettable night!! Wow, place is amazing highly recommend it!! Went with 2 of my friends and our waiter Val made our experience there an unforgettable evening. The owner Gary also came to table and was at door to say goodnight and thank you. Food was amazing, go you will never regret it! We had luncheon in March, 2015 after funeral service for 40 people. Service and quality of food was amazing. Thought we would get luncheon portions but dinner portions were served.Everything from the Antipasto to the Desserts were wonderful. The Penne Vodka apps was delicious and a meal on its own. The Veal and Fresh Fish was amazing. Some of the best Italian food I have had and I have had a lot. The owners are great from setting up the luncheon to the final tally. We were not gouged on drink prices as some restaurants do. I would highly recommend Verona's for your party of any size. I just regret that I don't live close by as this place would become my regular Italian restaurant. Message: My Wife and I recently dined at Verona and the food was expertely prepared and the service was phenominal right down to chairs being pulled out for my wife when seated. Message: We dined at Verona last night (my second time) and my boyfriends first. He has been looking for the perfect chicken scarprello (sp?) and has found it. 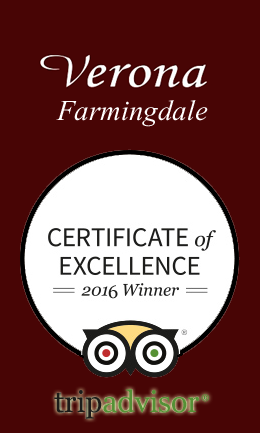 .... We live in Farmingdale and will definitly return and tell our friends about this wonderful place. Thank you ...for a job so well done. Message: The only thing I can say is I LOVE THIS PLACE! I recommend it to everyone I know, no matter where they live. The food is excellent, the service is excellent, the atmosphere is excellent. I have never been disappointed. My husband and I come here when we want a great meal, a good glass of wine and to take our time. They always make you feel warm and cozy, never rushed. It is very welcoming. The specials are superb, and when the chef comes out to talk to you about one of his new "creations" you know it will be good. I guess you can tell that I really like it here. © 2018 Verona Restaurant in Farmingdale Long Island NY. All Rights Reserved.